New in box RudyProject Spyllo Rimless, Chrome B-frame with BrownSand tips..
Spyllo Rimless irresistible look derives from the rimless frame structure which lighten the lines and emphasize the attractive dual colour temples with trendy and fresh tints. But the real innovation of Spyllo rimless is the energized temple technology, a flexible temple system which ensures that the temples, if extended, tend to go back immediately to their initial position, thereby ensuring a firm and comfy fit at the same time. 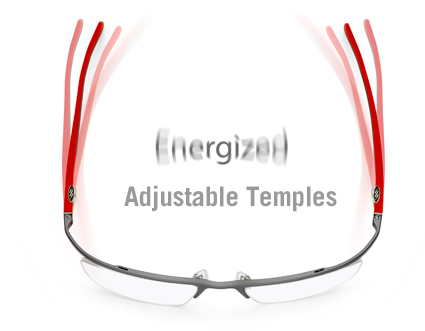 The temples, in fact, are made with the over-moulding of two types of rubber: rigid at the top and soft at the bottom, to guarantee total comfort. The ends are replaceable and have a harmonic steel insert which, thanks to the special machining of the core, ensures both vertical and horizontal adjustment. So, highly-advanced technology, but also a lot of colour. Spyllo rimless also offers ornaments in the same colour as the ends and is available in two different lens shapes, A and B, and even with a halfrim structure (Spyllo SUF).